Jackie Bartell is back with us this week for a fantastic discussion about a concept so essential to the Developmental, Individual differences, Relationship-based (DIR) model and Floortime, and that is that we are human beings not human doings. Jackie is a retired special educator who consults with the Interdisciplinary Council on Development and Learning (ICDL) and is a DIR Expert Training Leader. She previously discussed applying the DIR Model in public schools, inspiring relating, communicating and thinking, and visual prompts in Floortime with us. When Jackie thinks about DIR/Floortime, she thinks about building Relationships and how it helps our children and young adults build relationships with others. Rather than accomplishing activities on a checklist, or doing, being is about allowing us to be present, which is what you need when you’re in a relationship with another person: sharing a moment with another person and being mindful. It’s about staying with the child and supporting the child where they are, rather than thinking you have to do something for the child to be successful. Sometimes this concept can be a challenge for parents to grasp because when their child gets a diagnosis, they are given a list of things to do, do, do, and the earlier the better. When you are just being with someone, it feels like you aren’t doing anything. While we are doing Floortime, Floortime is about a way of being with your child that is very different than the traditional educational and behavioural models that are about teaching skills. While we can teach skills, we need to be able to showcase those skills through relating with others. The way we will help our children develop the capacity to relate is to be with them, enjoy with them, and connect with them. That’s what’s going to allow them to demonstrate what they know. Jackie also points out that it is not about them joining us, but about us joining them and what we do once we do join them. We have to be with them so we can see what is exciting for them so we can build that connection and bond. FEDC 1: Shared Attention and Regulation The first Functional Emotional Developmental Capacity is about being calm and being able to attend to the world around us. The child could be very fidgety or very withdrawn. We have to join them and just be with them in order to help them be with us. This could mean holding them tight and close, sitting next to them, or just being in the same space with them, depending on their sensory processing profile, so they feel that we are respectful of them, helping them feel calmer and safe with us. This could mean going into a space that is less cluttered, darker, or quiet–whatever that child needs to find that place of ‘calm’. We might have to work on this being across many Floortime sessions to get to that place of calm, and that is ok. When we do this, the child learns “that person is going to help me feel internally comfortable and safe”. 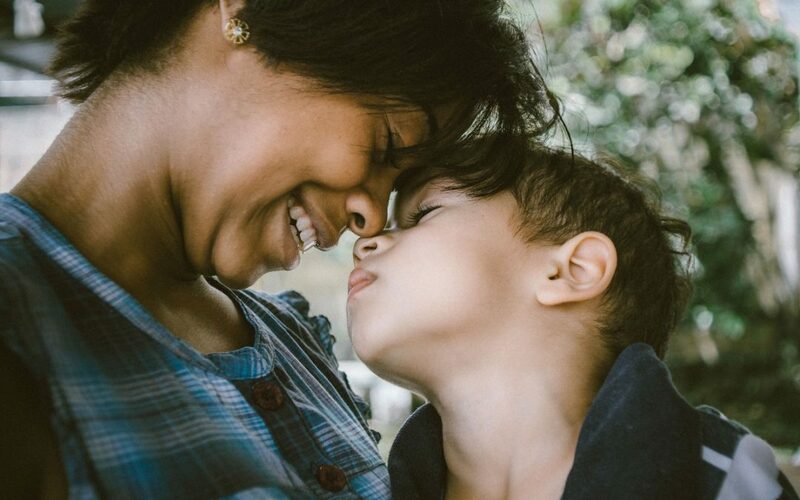 So even though it might feel like you are doing the same thing over and over again, your child is learning something about the Relationship in that moment. Dr. Gil Tippy has pointed out that we don’t always have the luxury of creating the perfect environment for our child, so we have to figure out ways to regulate across other situations as well. I gave the example of bringing my son to the grocery store which can be very overstimulating for him. By putting a heavy item in the cart and having him push the cart, I assist his regulation in two ways: by giving him the proprioceptive input his particular sensory system craves all day long, and by doing it together with me. Jackie points out that he is also learning about the world because I am not forcing him to tolerate the grocery store, but using our Relationship to help show him how the world works. FEDC 2: Engagement and Relating The second Functional Emotional Developmental Capacity is about having intimacy with each other. It’s shared moments together where you are calm and regulated but ‘in it’ together. Jackie points out how this really is the being capacity because it can so easily be skipped. Once the child is regulated, it’s so tempting to want to interact and tell them what to do or get something happening. When all these demands get put on the child, we see dysregulation. First our children need to experience how to just be with another person. I love how many refer to this capacity as getting the ‘gleam in the eye’. In my grocery store example, it’s about my son being content and feeling safe within our Relationship while pushing that cart, being connected with me. This is different than him just pushing the cart on his own. In a playful Floortime session, it’s about finding that activity that so interests the child that they have that look in their eye of eagerness or excitement to be sharing what they love, in that moment, with another person. Jackie worked with a girl who loved fidgeting with her toys. She would twist and rotate her wrists while holding objects, and she had a lot of language. So Jackie joined her by also twisting the toy she was holding, and used language. The girl got up and walked away from her. Jackie got the message that she was regulated, but she wasn’t engaged or sharing attention, so Jackie just sat with her without any expectation. As Jackie continued to do this, she could see the girl feel safer and periodically look at her, and Jackie got the gleam in the eye from her. Jackie continued to give the girl practice in just being with her when they got together, which helped them build their intimacy and connection. It’s that feeling of “Oh, there you are“. When children with developmental challenges are fidgeting, scripting language, rocking, or doing other regulating behaviours and we put demands on them, you might see those behaviours intensify which tells us that they are getting more anxious. Jackie says that this is a way for them to tell us that we aren’t listening or seeing that they are anxious, stressed, or overloaded, and sometimes we might see aggression. This should be a sign to us that we need to just be with them, rather than continue to put demands on them. Their behaviour is their way of communicating with us–and might be the only way they know how to communicate with us. It is our responsibility to figure out what their behaviour is telling us by being with them, attuning to them, and looking at the environment for clues as to why they are feeling overwhelmed. Surely, though, we can’t be catering to inappropriate behaviours such as kicking, hitting, spitting, and knocking things over, even in public, as a cost to this approach? Jackie says of course not, however, we have to understand why these behaviours exist and determine what we are doing to contribute to their appearance and frequency. So we must ask, “Where is the behaviour coming from? What are they trying to communicate to me?” and we often find that we are asking for things, doing things, or having expectations that they cannot do or meet. Their bodies and who they are are not able to meet our expectations. We are focused on doing instead of being. In Jackie’s example, she was asking and expecting the girl to talk to her (i.e., to do something), and despite her language skills, the girl wasn’t able to do that in that moment, so Jackie just had to be with her. But I've successfully taught my child skills! There also will be parents who say that they have successfully taught their child skills! Why are we suggesting we not focus on teaching skills? Sure, you can teach all of the colours, all of the animals, and skills, but the question is can you talk to me about any of these facts or skills? Can you tell me that you want the red popsicle versus the green popsicle? It’s wonderful to have a lot of skills, but if we can’t share them with another person, there’s no connection and it’s just showcasing skills. It’s about how we can use these skills and can we use them in the context of interaction with another person? It’s like being able to read what is written, but not comprehending the content of what’s written. Another point of importance is that of intrinsic motivation of our child to want to relate with us versus being compliant or reciting or performing to please us, which is extrinsically motivated. Jackie says that sometimes this is how the child is working on learning how to be with their caregivers. It might have nothing to do with the content that the parents are working on. As long as we’re focusing on the shared attention, the relationship, and the communication that’s going back and forth, that is ok. Jackie gives the example of asking how big something is and replying that it is “sooo big!” with our hands in the air, using big affect. Our children are going to learn skills along the way, but we can use those skills in an interactive and related way. So if our child knows every train from Thomas and Friends, for example, how can we talk about those trains in an interactive way? It’s about using their list of stuff in an interactive way. How do we use the list and instead of asking the child to name more stuff, make it about being? That’s the tricky part. FEDC 3: Purposeful emotional interactions The third Functional Emotional Developmental Capacity is about getting a back-and-forth reciprocity of non-verbal communication (gestural, facial expressions, body language, etc.) with another person, which is an affective connection with somebody. To demonstrate, Jackie made a funny face at me, I chuckled, she might respond by covering her eyes, and I might respond back by moving her hands away, etc. Going back and forth and back and forth with affect is not about verbal language, although that can certainly be a part of it in verbal children. It’s about affective reciprocal interactions. Jackie gave an example of a boy she worked with who knew many nouns and labels that he would list continuously. So that’s where Jackie joined him. He loved the Seven Dwarfs from the fairy tale Snow White so if he said “Sleepy“, Jackie would try to make it interactive by saying with a lot of affect in her voice, “Sleeeeepy….” until she was able to get him reciprocating with her with affective signalling of looks, gestures, smiles, facial expressions, etc. Jackie reminded us how important it is to not focus on content such as asking a question and getting an answer, but on what can be referred to as ‘nonsense’–that is, using big, dramatic affect to keep the interaction going when you say things like, “What? !” “Oh nooo!” “What happened? !” while putting your hands on your head or gesturing with a surprised look on your face. Please refer to the blog post Slowing down and stretching out interactions and the challenges at FEDC 3 blog post for a full description of this process to prolong interactions. FEDC 4: Shared social problem-solving The fourth Functional Emotional Developmental Capacity is about being able to solve a problem together with someone while interacting back-and-forth. This is where content starts to become part of the interaction. Being in this capacity is about staying in the moment of whatever the social problem is. Jackie used an example referring to the previous podcast we did together where we were at a museum enjoying one of the exhibits but wanted to move on to other parts of the museum, which were also so fun. My son couldn’t understand and really just wanted to stay at the cool ball machine. This became our problem and Jackie attempted to solve it with him socially by just being with him in that moment, giving him examples and choices to help him understand that we would go see other parts of the museum, and still be able to return to the fun ball machine afterwards. She did it in a way that was staying in that moment with this social problem rather than saying, “Ok we’re moving on now!” or saying, “5..4..3..2..1… let’s go!” which may or may not have ended well. In these higher capacities now (FEDC 4, 5, and 6), it is very easy for us to tend to want to focus on doing even when our kids aren’t there. They need the time and space to be able to learn the emotional skills required to be able to engage at these capacities, so it’s especially important to stay present and stay in the moment with them. They need the time to process what is happening and the time to be ready, which are both part of solving that problem together. You might find that you need to move back down to just being with them until they are ready to move back up to shared problem-solving again. The concept of being is also very regulating for our children. FEDC 5: Creating emotional ideas and FEDC 6: Logical thinking and building bridges between ideas The fifth and sixth Functional Emotional Developmental Capacities are about communicating emotional content and symbolic thinking (FEDC 5) and connecting these ideas together logically (FEDC 6). At these capacities, Jackie says that it is easy for us–when we see our children demonstrating these capacities–to jump in with our own ideas and start doing things and asking them to join us. This is where we have to be so mindful of joining the child in what they are doing in the theme of what they have going on. We do this by being present in the moment and figure out where the child is, what they’re motivated by and interested in, and if we are giving them ideas, making the ideas about what they are interested in and meeting them there. Jackie gives the example of a child pretending that they are going to a grocery store in play. It might be easy for us to meet them there, then suggest we buy this or that. But the child may be going to the grocery store for a different reason. Instead, we might say, “Oh! What are we going there for?” or we might offer a suggestion if they cannot answer us (perhaps due to motor planning and sequencing challenges): “Could we be doing (this) or (that)?” So, rather than coming up with the idea, we want to help the child be actively engaged in coming up with the ideas. This means we stay in the moment, stay with where the child is, being present with their ideas, and not bringing in things that we think are relevant. When we are not staying with the child, they will tend to give us information by stepping away from the activity or by shutting down. Jackie leaves us with the reminder that we are human beings, not human doings. If you have one take-away from today it’s that we can actually do a lot more by spending more time being with our child and forming that bond and connection that will help them build their social-emotional capacities to relate and be with others in a social, shared world. Thank you to Jackie Bartell for taking the time to share these thoughts with us! Did you learn something about Floortime from today’s podcast? Did you learn how important it is to help our children develop the capacity to be with others and how being with them helps them feel safe and connected before we start worrying about doing things with them? How it’s not about what I want as a caregiver or therapist, but about what they want and about us engaging with them rather than expecting them to engage with us? If so, I hope you’ll Comment below or Share this post on Facebook and/or Twitter.